I’ve spent the past year in Vietnam teaching English to small hordes of children who I can only sort of understand and who only sort of understand me. In that time, my main mode of transportation has been a moped or small motorcycle. I started on a Yamaha Nouvo 3, an automatic (“squeeze, go.” as the man I rented it from helpfully instructed) 125cc scooter, and ended up on a Suzuki GN125, a manual 125cc motorcycle. After an entire year on a motorcycle, I don’t know if I want to go back to four wheels. During a recent trip in a taxi, I realized that I had started to get car sick as I sat in the back. Granted, the driver was swerving and accelerating and decelerating very quickly trying to pick his way through rush hour traffic, but it was not something that I usually experience. Many of my Vietnamese friends have to be careful to avoid being car sick. They take motion sickness pills before long bus and car trips, and it seems like I might have to start doing the same. You never really get the side-to-side G-force that you get in cars since you are always leaning into the turn on a motorcycle. The fact that a motorcycle leans also makes it more fun to ride and much easier to maneuver in city traffic jams. 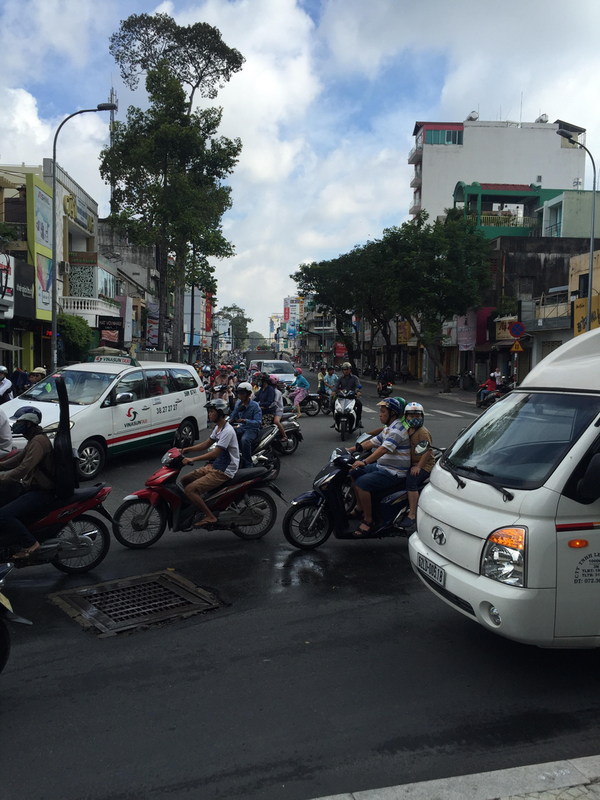 I know most places will not allow you to ease your way through any gap, drive on sidewalks and down the wrong side of the street, and generally just get through a traffic jam any way possible like you can in Vietnam, but motorcycles can pass and park easier than a full size vehicle. As long as you maintain a safe speed and stay aware, driving in a city on a motorbike can be easy and rewarding. Speaking of rewarding, how much are you currently paying in gas to get to work? My roundtrip commute is about 6 km so it ends up being 30 km a week. Because of Vietnam’s oil holdings and government subsidies, gas only costs about 16,000 VND per liter ($0.71 USD) which works out to roughly $2.68 USD per gallon. On my Suzuki, I use about two liters a week which includes any extra trips around town. To travel the same distance in my 2006 Volkswagen Jetta, I would use at least twice as much fuel. A motorbike could be an easy way to save on fuel costs, especially if you are driving mostly in a city. There are some cons to riding a motorbike, and I’ve had my share of drops and bumps, but thankfully I’ve avoided getting smushed by a bus or wayward concrete truck so far. Ho Chi Minh City’s traffic is actually pretty ordered once you learn to see the flow. There have been some close calls, but luckily everyone is looking out for everyone else. The biggest issue I’ve faced (and I’m sure this is common for anyone living in a climate with extremes) is the weather. It is a terrible feeling to be driving along and then see a wall of rain coming at you. I fixed this issue by purchasing a good rain suit complete with booties to keep my feet dry. Depending on where you live (I’m looking at you Minnesota), it may not be feasible to ride all year long, but that will just make it more enjoyable when you get out of your cage in the Spring. I’ll be here in Vietnam for another year, so I don’t have to worry about what I’ll do when I head back to the States. I plan on getting my motorcycle endorsement when I’m home in December (then I get to ride bikes over 150cc in Vietnam! ); however, I’m a little scared that American drivers might be too selfish to make it a good idea for me to commute on a motorbike. Despite the risk, you won’t be able to keep me off a motorcycle for good. I’m hopelessly and completely hooked after a year on two wheels.